At the TTC’s Audit & Risk Management Committee meeting of May 29, 2018, staff presented a report entitled Internal Audit Quarterly Update: Q1 2018. That is not the sort of title that would prompt avid late-night reading, but one item within the report sparked a brief conversation between the committee and staff. There are several issues related to the management of overnight work in the subway which requires a variety of resources including staff, work cars, power cuts and central supervision to keep all of the crews from tripping over each other. One part of the ongoing audit work is to review the systems (many automated, but some manual) used to schedule and track the work plans, but another issue raised was the relatively short maintenance window within which work can be done. Responding to a question, staff advised that they are reviewing the operating hours of the subway to determine whether changing these hours could improve the productivity of overnight maintenance work. TTC’s revenue subway service hours limit the nightly maintenance window, which impacts the efficiency and effectiveness of track level work and exposes subway infrastructure to accelerated deterioration. Per an international CoMET/Nova benchmark study of “Metro Key Performance Indicators (2016 data)”, TTC ranked fourth amongst 34 participants in terms of subway service density or network utilization – a standardized method that measures operated passenger capacity compared to network size. This KPI reflects the ‘intensity of utilization of the metro network’, which is a function of train frequency, train length and car capacity. The study asserts high train frequency may reflect a good use of fixed infrastructure, but the intense impact on asset utilization should be warranted by ridership demand, i.e., recognizing the need to balance competing objectives of making subway service more available for customers versus the costs associated with accelerated deterioration of subway infrastructure and assets due to an increase in daily use. 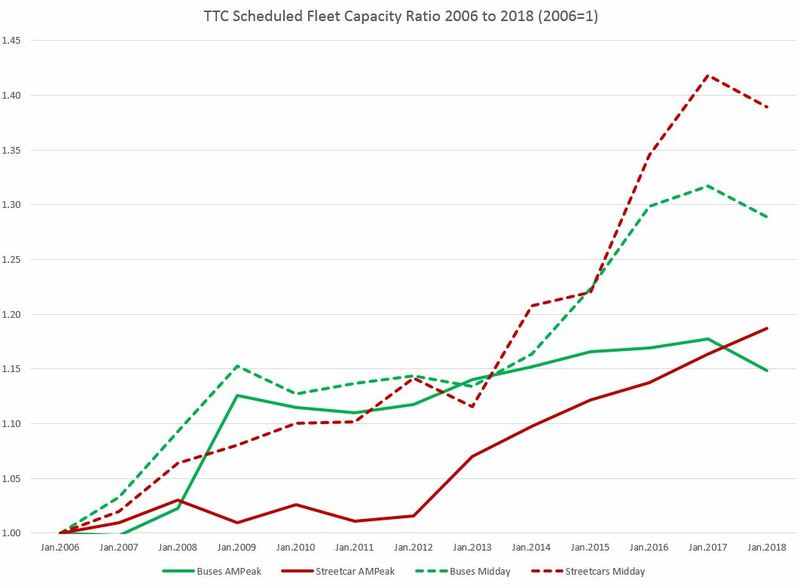 The study comments that TTC offers relatively high levels of capacity primarily due to larger trains and higher frequencies across its entire, relatively small network. TTC track level work starts once the system is fully cleared of revenue trains. 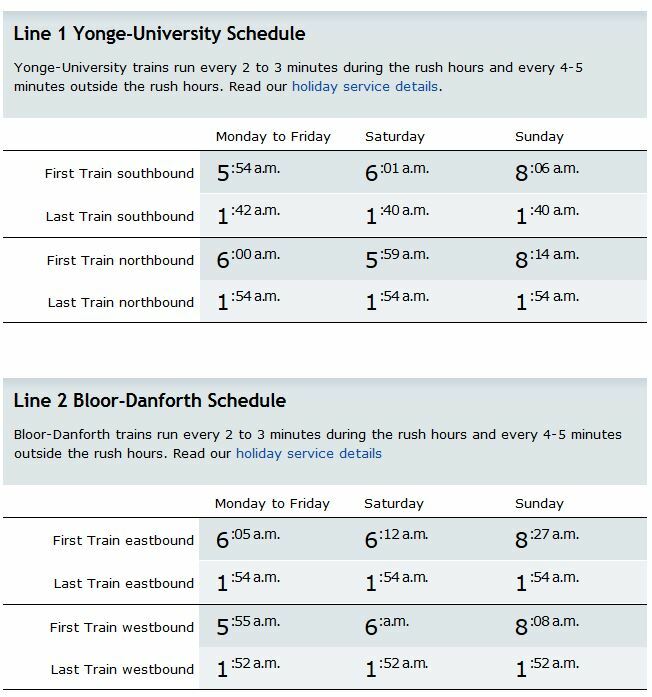 TTC’s subway system is closed to the public at 1:30am and opens at 6:00am on week days and Saturdays, and at 8:00am on Sundays. However, trains continue to run through the system until approximately 2:30am and re-enter the system at around 5:30am, leaving an average total available daily maintenance window of 180 minutes (300 minutes on Sundays as service preparation starts around 7:30am). Night shift work typically runs from 10:30pm to 7am, including a 30-minute unpaid meal break. Per discussion with Subway Infrastructure management, track level set-up activities typically start at 2:45am and Transit Control requests crews to complete work and start clearing the track at 5:00am. Work activities expected to be performed out-side of this track level access time period include employee roll-call, safety-talks/briefings, work car preparation, and tools maintenance, etc. In a Nova comparison study, “Track Possession Timings ” (2014), it was noted that given TTC’s subway service hours, and taking into account estimated time required for set-up and safety check activities, as well as post work preparation for service, TTC workers’ total available time to work productively at track level was between 30 and 225 mins less than the other ten participants. Further, the average maintenance window of these other participants was almost 2hrs longer than that of TTC. If the maintenance window was to be increased by 2 additional hours, 5 nights a week, Audit estimates the opportunity for improved productivity by SI’s Track Maintenance and Structure Maintenance Sections alone to be valued at approximately $3.38 million. Such a change would also reduce overtime and potentially the need for weekend closures by these two groups. Based on payroll data, Track Maintenance and Structure Maintenance incurred overtime costs of $4.58M and $1.26M respectively in 2017. Structure Maintenance Management estimates that if the maintenance window was to be extended by 2 hours, 5 nights a week, the annual overtime for this Section could be reduced by 75%, which in 2017, would be equal to approximately $945K. It is reasonable to assume productivity improvements and material overtime savings could be realized by other groups that complete maintenance and capital project work at track level if the maintenance window is extended. Note that the “other ten participants” are not listed nor are the relative service levels of their transit systems mentioned to indicate whether they are valid comparators for Toronto. 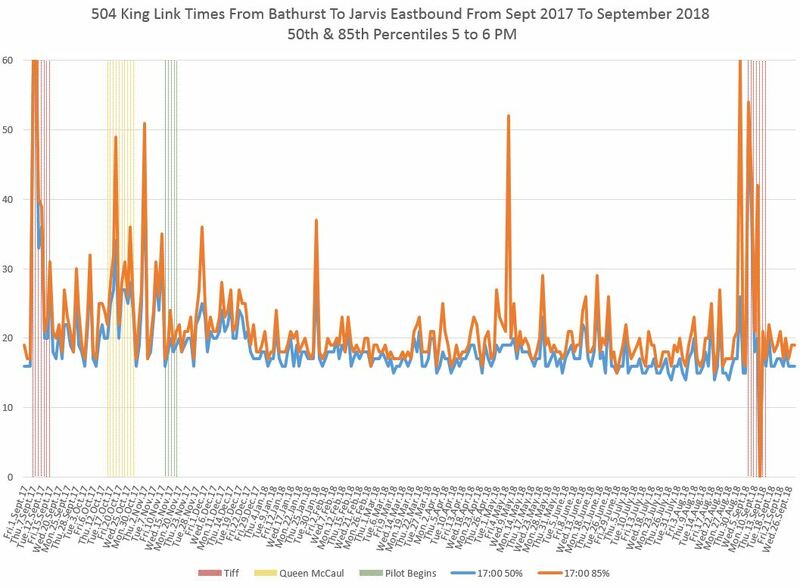 Evaluate actual ridership and revenue associated with TTC’s late-night subway service (after midnight runs) to ensure current intensity of service and impact on subway infrastructure (and vehicle) asset maintenance costs are warranted. Conduct in-depth analysis of TTC’s current subway infrastructure asset management approach, resource planning and crewing methods, work car dispatching techniques and work methods to identify opportunities for maximizing productivity and transparency of resource utilization at track level. This was striking on at least two counts. First, there is no recognition in the report that closing earlier is anything more than a question of sending trains back to the yard earlier, and no mention of providing replacement service. 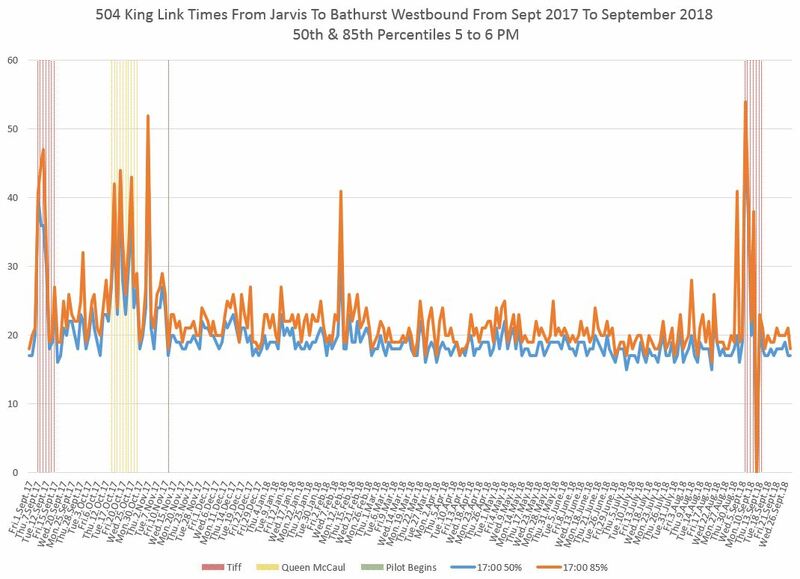 It is no secret that night buses on Yonge and Bloor-Danforth are very heavily loaded after 2 am and, if anything, more service is needed then. A similar problem occurs during the early part of the day before the subway opens. The auditors also seem to be unaware that there is no night service to replace the University-Spadina subway, and this is difficult (as users of Spadina shuttles know) because the subway does not follow an arterial road like Yonge or Bloor. If two hours were added to the shutdown period, the amount of bus service required to replace the subway would be substantial, and it is likely that ridership would be lost thanks to the relative inconvenience. Moreover, there would be knock-on effects for users of connecting bus services who would face much longer journeys to their connection points on a surface bus, and who might also face a decline in service thanks to the unattractiveness of the night bus replacement for the subway. This change could actually trigger a system-wide retrenchment of service hours. Second, there was absolutely no intimation that anyone at the meeting was aware of just how severe the impacts of this proposal would be on riders, nor was there any attempt to defend their interests. Indeed, the focus is on making the maintenance teams more efficient and saving millions without considering the offsetting costs and potential lost revenue. Some of the basic assumptions in the text quoted above are wrong, notably a claimed closing time for the subway of 1:30 am. In fact, the closing time varies across the system. There is a scheduled meet of the last northbound, eastbound and westbound trains at Bloor-Yonge at about 1:54 am that has been in place since the BD line opened in 1966. Stations close as these last trains make their way outbound to terminals. One might hope the auditors would check with TTC planners or even simply look at their own website. The last train eastbound on Line 4 Sheppard does not leave Yonge-Sheppard station until 2:14 am. It is quite clear to anyone who actually rides the subway late at night that it does not close at 1:30 am across the network. This is only the start of a process that continues until about 2:30 am, and some trains have to return to their overnight storage locations even later. The maintenance window varies depending where one is on the network. The comment in the report about “accelerated deterioration of subway infrastructure and assets” is a function of the very frequent service the TTC provides across the entire subway system at all hours with trains every 5 minutes or better until almost the end of service. How much extra wear and tear this represents since the subway opened in 1954 might be of interest, but this service level is a matter of TTC Service Standards. One could argue that full service is not required, based on demand, beyond a core portion of the system late at night. However, I dare any politician to stand up and tell suburban Toronto that they will lose their frequent service just because the trains are not full. 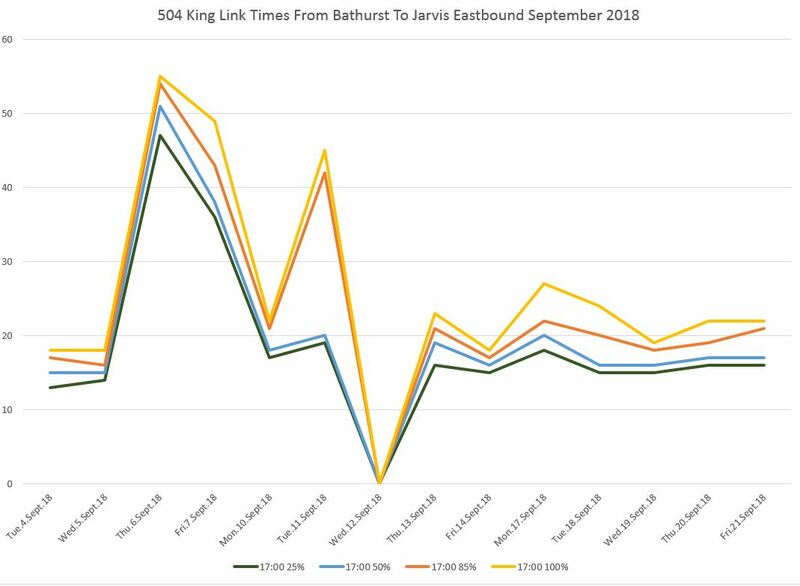 Another issue here is that actually running the trains is only part of total subway costs, and unless one can also drop staffing levels associated with stations, security, line supervision and on-call maintainers, the saving of running, say, only half of the service beyond a turnback point such as Eglinton is small. The same consideration applies to running less frequent service generally – the trains are only part of the overall operating cost. It is important to note that this “accelerated deterioration” is a function of frequent service over long hours, not some side-effect of inefficient maintenance procedures as one might erroneously read the audit report. I hope that if there is a detailed study, it will take into account the benefits of good late night and early morning service on the subway, not to mention the requirements for substantially improved night bus service. Indeed the existing night service needs improving, but languishes thanks to a combination of indifference and budget restraints. It is only a few years since the TTC began Sunday service at 8:00 am rather than 9:00 am in January 2016. 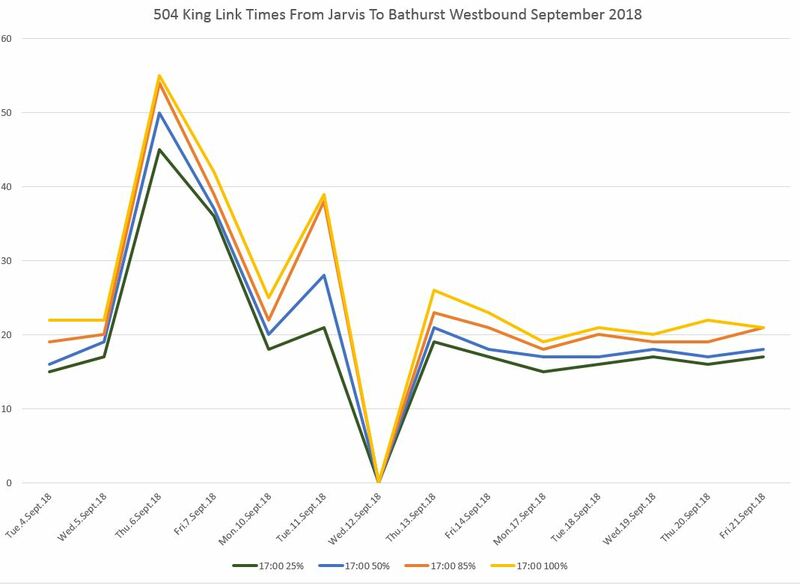 Early Sunday openings are the latest service improvement to be introduced in recent months, following this year’s expansion of overnight service and all-day, every-day service across the city, implementation of ten-minute-or-better service and reduced off-peak crowding on bus and streetcar routes. Someone should send a copy of this letter to the auditors who appear to be incapable of making a full evaluation of the effects of their recommendations or even appreciating the seriousness of what they propose. “Efficiency” in one department does not mean better service for the organization and the City as a whole.